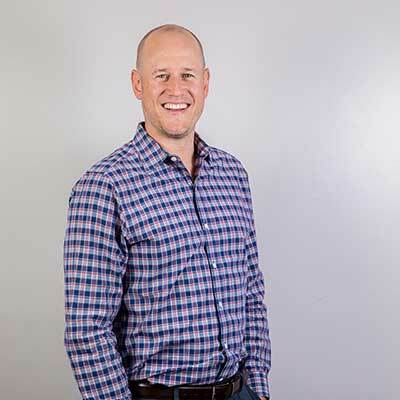 Dr. Ben Leeper’s number one priority is to make every appointment a positive experience for his patients. So every aspect of his practice, ranging from the atmosphere of the office to his friendly, reassuring staff to his own philosophy on patient care and education, was designed with patient comfort in mind. In an office filled with the sounds of chatter and laughter, Dr. Leeper follows a routine that is designed to put the patient in control. In order to have a positive and beneficial experience, patients must trust their dentist. Dr. Leeper earns that trust through communication and education. If a patient is facing a problem, Dr. Leeper will explain what’s going on and show the patient photos of the problem area. Because Dr. Leeper believes that patients should be involved with their own health care, he then outlines the risk and benefits of his proposed solution. If a procedure is necessary, he details what that procedure would entail as well as what patients should expect during the healing process. This is always an open dialogue. During the appointment, Dr. Leeper keeps patients informed during procedures and maintains a gentle, calm touch, and patients always have the option to take breaks. After completing the procedure, Dr. Leeper spends time with patients to explain the healing process and discuss how problems can be avoided for future appointments. Since oral health is an important component of patients’ overall health, Dr. Leeper works to make every visit a beneficial experience that ultimately contributes to a happier and healthier life. By centering his practice around patient comfort, he hopes to make every appointment a beneficial and positive experience. Since moving to Casper in 2011 from Lincoln, Nebraska, Dr. Leeper, his wife Dannie and their three kids have integrated themselves into the Casper community. After leaving the Nebraska plains, the family now takes advantage of Wyoming recreation, including snowboarding and golfing. Since she began working as a hygienist in the early 2000s, Kim Estes has seen many teeth and many smiles. She’s also worked at different dentists’ offices, and now she appreciates the conservative nature of Dr. Leeper’s care and the camaraderie of his team. And because of the familial nature of the office, Kim is able to spend valuable time with her patients without ever having to rush through appointments. This enables her to provide thorough cleanings and educate her patients on gum health and proper flossing, two of her favorite topics. Kim has lived in Wyoming most of her life, and has hiked many of its mountains and golfed many of its courses. Inside, she loves to read. After more than 35 years as a practicing hygienist, Cherie Strang has seen a lot of nervous patients. In that time, she’s learned how to adjust her techniques and strategies to make patients more comfortable. The first step is to get to know patients and sympathize with their anxieties. This compassion then guides her approach to appointments. For example, if a certain piece of equipment makes a patient especially nervous, Cherie will perform that procedure manually, if possible. She became interested in hygiene because she wanted to help people, so she goes to work with that objective in mind. Additionally, the most rewarding aspect of her job is when her patients have made significant changes to improve their oral health and show growth each visit. 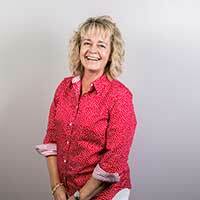 Cherie’s patients know that she is there to be of service to them and help them improve their lives. Cherie keeps her hands busy outside of work, as well, with a myriad of activities including gardening, skiing and reading. 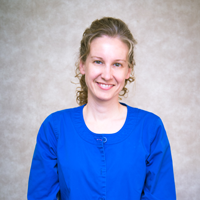 Dental Hygienist Sarah Chafee is a perfectionist, and she takes her time with everything. 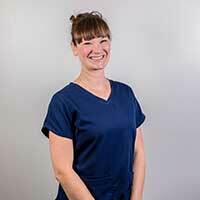 For example, when a patient comes in nervous or scared, Sarah spends extra time working with those patients. 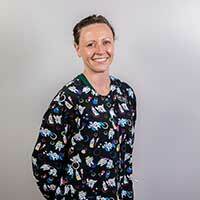 She believes that when she is able to do her job carefully, conscientiously and gently, patients will trust her. And if a patient does require extra time during a visit, Sarah makes a note in the patient’s chart to schedule a longer appointment for that patient’s next visit. This extra time and care fosters a relationship of trust. Sarah prides herself on the integrity of the office – patients’ needs and comfort are always considered before anything else. Her perfectionism is apparent in her personal life, as she enjoys working on home improvement projects with the same level of attention and care. Both of Sarah’s kids have adopted her thoroughness, and her 7 year-old proudly flosses every day. 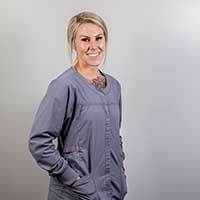 Halie Haefele believes in the power of dentistry and how even small changes she’s able to make during an appointment can have big impacts on patients after they leave the office. Providing a comfortable, personable and knowledgeable experience during every visit is her top priority, because she knows that having a healthy mouth is a critical component of a healthy body. She loves when she runs into patients outside of the office and sees their smiles that she helped make a little brighter. This often happens at her gym, her daughter’s softball games, or on the mountain snowboarding. Since she began at this dental office in 1976, Front Office Manager Pam Daugherity knows how to make patients comfortable. As patients’ first line of communication, Pam knows each individual’s level of nerves or anxiety from the initial phone call. She will be the first person to welcome patients into the office, which patients find immediately reassuring since the atmosphere is friendly and inviting. 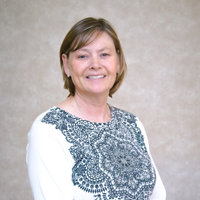 Pam’s primary goal is to guarantee that every patient is given the utmost care and attention. Everyone in the office, patients and employees alike, is special. Communication with the staff regarding the patient’s level of anxiety is essential to achieving this goal, and as a former dental assistant, wife, mother and grandma, she has plenty of experience attending to others.